Members of the British royal family gathered at St. Margaret’s Church this morning to celebrate the life of Lord Snowdon who died in January. Queen Elizabeth led the delegation paying tribute to her late former brother-in-law in the royal purple felt hat with straight sided crown, cuff style upfolded brim, and silk iris trim we first saw her wear last November. Countess Snowdon wore an ecru straw bumper style hat with ruched brim topped with a widely woven net veil and large spiky feather dahlia flower on the side (click on the twitter photo below to open a larger view of the piece). Lady Margarita Armstrong-Jones wore a beret-based percher hat in ecru straw printed with grey polka dots and trimmed with a large black looped bow printed with a gold lattice pattern. While I think I might have preferred the hat to be placed over her left eye (as perchers are usually worn) instead of as a calot on the crown of her head, it’s great to see Margarita experimenting with different and more substantial millinery designs. 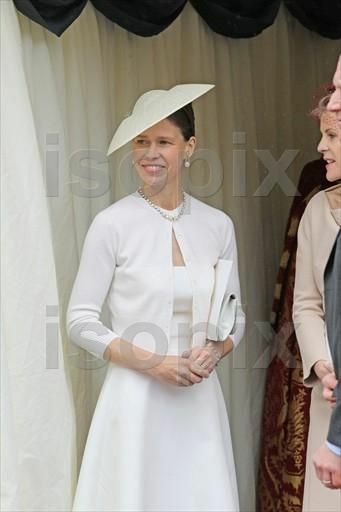 Lady Sarah Chatto repeated her cream straw saucer hat. Her half-sister, Lady Frances von Hofmannsthal, wore a black velvet turban trimmed with black net tulle veil. The event was also attended by the Duke of Edinburgh, Duke of Kent, Duke of Cambridge, Duke of York, the Earl of Wessex, Viscount Linley (Charles Armstrong-Jones), Daniel Chatto, Samuel Chatto and Arthur Chatto. Any thoughts about these hats today in Westminster? This entry was posted in Great Britain and tagged Countess of Snowdon, Lady Margarita Armstrong-Jones, Lady Sarah Chatto, Queen Elizabeth. Bookmark the permalink. Isn’t Viscount Linley David, not Charles? There’s quite an assortment of hats for a small group. I like Lilibet in purple, and her hat is a shape I like. Sarah has found her winning look. She looks very comfortable in her cardigan. Serena’s hat I prefer from the wild chrysanthemum side. They’ve all moved up one. David takes his father’s title and Charles takes David’s former title. That’s why it’s called an hereditary title, it’s inherited on death. David Linley is now the second Lord Snowdon, having inherited his late father’s title. At the same time, his son, Charles Armstrong-Jones, inherited the title Viscount Linley. HM still looks wonderful in this color, although I’m less excited about this hat than when it first debuted. The floral detailing does seem to be trimmed back a little compared to its first outing, but I still think the very square shaping of this hat is a bit harsh/severe. Better photos would help me make a more qualified judgment of Serena’s hat, but for not I will say it’s not bad, but I would prefer other hats on her. I really enjoy the details on Serena’s jacket though! I agree the placement of Margarita’s headpiece is way off, but the hat itself looks very nice. Hopefully it will get another outing with improved placement. Further proof Sarah Chatto will not change her ways! This is always a good shape for her, but I agree with @JamesB a little variety has never hurt anyone. First time I’ve seen the headband on this hat so close up, and it’s interesting how there is a comb on the headband, which seems odd and unnecessary. Frances’ entire look is very mismatched, and unfortunately I just don’t see anything I really care for. Thank you for this confirmation! Comparing this appearance of the queen’s hat to that of November of last year, my impression is that the garden has been somewhat pruned since then, but I may be wrong. In any event, I rather like this bouquet, a bright note in keeping with the nature of the service. A very handsome color on HM, the purple. Lady Margarita looked completely charming, askew hat (a very pretty one) and all. The photo of the elegantly hatted Lady Sarah and her brother together was very winning. The Queen certainly stands out, as she should, in this gorgeous purple outfit with touches of velvet (my soft spot). Countess Serena is beautifully dressed, but her hat seems a bit messy. Nevertheless I do agree that the black and white scheme elevates the look into something more suitable for a celebration of life, rather than just mourning the passing of one, and the dahlia pouf on the hat does strike a happy note. Lady Margarita’s hat could be very nice but seems badly positioned. I don’t care for the ensembles of Lady Frances or Lady Sarah, which don’t seem chicly retro to me, but just dowdy. On the bright side, Lady Sarah’s hat is nice in itself and would work great with a pretty spring dress. The silk iris trim on the Queen’s hat makes even less since this time than it did last fall, when the coat was worn with a white and purple dress, which presumably had an iris theme. This time a purple dress to match the coat fabric seems to have appeared. The white iris, therefore, seems even bigger and less necessary than before. Lady Sara Chatto certainly sticks to her signature look. That black and white/cream colour scheme most of the ladies have gone for is very effective. Sarah sure knows what she likes – she has a variant of this outfit whenever she goes out! Now it works for her, but a tad of variety wouldn’t hurt! The Queen’s semi mourning purple works well, but that hat still could do with a haircut…. A nice family gathering to remember the very talented Lord Snowdon. I remember a Christmas at Sandringham photograph with a very young Margarita standing beside the Queen. Lady Sara reminds me of myself in one way only. Recently my daughter was present when I bought a new sweater. She commented “Mummy, don’t you already have that sweater? ” And I had to admit, that, although I didn’t haven that actual garment, it ran true to form for my wardrobe. I know what I like and what (I think) looks good on me. Lady Sarah is the same, and Countess Serena, while not as predictable, looks good in retro 60’s styles. I also appreciate the “semi-mourning” colours. Her Majesty looks majestic in Lenten Purple. Having said that, Lady Frances’s ensemble has a certain randomness to it. Lady Frances is Sarah’s half-sister, not step-sister. Indeed she is. Correction made. Nice hats from everybody, even the beret/calot on young Lady Margarita works because of her youth. The new Countess really brings the retro 60s style to life so chic! Lady Sarah (appears to be wearing a hooped underskirt? seems unnecessary) knows which hats suit her and looks very smart. Lady Frances is half-sister to the Earl and Lady Sarah and I love purple and black velvet but I’m not sure about this one!